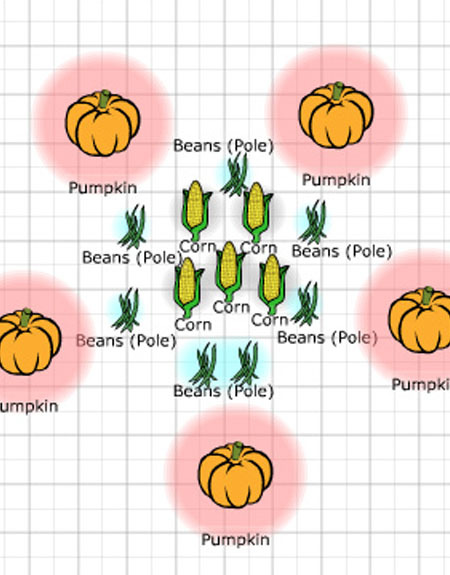 Three hundred years ago, when early American colonists took a look at the food gardens in Native American villages, they often saw a unique companion planting plan – corn, pole beans and pumpkins or squash being grown together in the same plot. Compared to the neatly plowed rows and fields of Europe, these “corn gardens” looked suspiciously wild, but for the Iroquois, Cherokee, and other Native American tribes who grew Three Sisters Gardens, their success amounted to a minor agricultural revolution. With cleared land at a premium, here was a way to grow three nutritious, easy-to-store crops in one space. Companion planting plans based on three sisters gardening concepts can be very successful, even if you use them in bits and pieces. My first experience with a three sisters garden happened by accident many years ago, when I planted pumpkins close to my sweet corn. The pumpkin vines found the dappled shade between the corn rows and took off, because instead of competing for light, the two crops shared it. The pumpkin vines benefited the corn by shading the soil, so the two plants made a very happy partnership. More recently, I’ve started filling gaps in rows of sweet corn with pole beans, a three sisters technique that works great if you get the timing right (keep reading). True, companion planting corn and pumpkins or corn and beans involves only two sisters, but you are still looking at growing two crops rather than one in the same amount of space. Adding a third plant limits your access to the others, which is not an issue when all the crops are harvested when fully mature – dry grain corn, hard storage squash, and dry beans. However, simplification is needed if you’re growing sweet corn and/or snap beans, which are harvested when immature, and not all in one day. It is impossible to tiptoe through the squash vines to pick snap beans without doing significant damage. A three sisters garden is basically a “stacked” garden that uses three layers to fill the space. The upright element is traditionally corn, but sunflowers or grain sorghum make interesting alternatives. In terms of timing, it’s important that the upright crop has a two to three-week head start if it is to serve as a good support for vigorous beans. The slight shade cast by the upright crop makes the beans grow slowly at first, but by the time the corn is in decline, the beans are poised to explode with new growth. Shade is not a friend to squash family crops, which need maximum light to avoid growth delays. This is why squash or pumpkins are planted on the outer edges of a three sisters garden, where they form a dense ground cover. Click here to see a layout for a 12X12-foot (4 square meter) traditional three sisters garden using the GrowVeg Planner. In terms of varieties, you can preserve the historic dimension of the three sisters by using heirloom varieties, or you can add updated varieties to the mix. Personally, I like to pair a robust, mid-season hybrid sweet corn variety like 'Delectable' with a beautiful heirloom dry bean like 'Hidatsa Shield' bean. Space-saving squash varieties like ‘Ponca’ butternut are useful where space is tight. Indeed, you would need a compact variety to get good results with my Three Sisters planting plan for small gardens, which you can see here. That said, I think the Three Sisters concepts work best where there is enough space to capitalize on the plants’ shared benefits. The more I have played with this 20-foot square plan, the better I like it, mostly because it uses interplanting techniques that have proven successful in my garden. When I grew prickly spaghetti squash by my beans, deer and other pests had a hard time finding the beans. Sunflowers are stars wherever you grow them, and they make great companions for fast-growing bush beans. Historically, beans are latecomers to the party. Ethnobiologists believe that beans were adopted by Native American tribes long after they became familiar with corn and squash, so the planting of three sisters gardens probably did not begin until after 1000 AD. Imagine the ancient gardener, accustomed to growing corn and squash together, who adds the strange new vegetable, bean, to the mix. Wow, they probably thought, this is really something, these crops seem to work together so well, just like three good sisters. As companion planting methods go, the three sisters set a high standard. "My heritage is Cherokee/Celtic and this was always the way my Dad planted his garden. He would also bury some fish parts underneath for fertilizer! " "Hi, just wondering, would this work with courgettes instead of pumpkins? I'm the only one who likes pumpkins in my family, so there's no point growing them if nobody wants to eat them. Thanks for your advice! Tina"
"My garden is a collection of raised beds and generally I rotate my crops. Growing a 3 sister garden would require more space than my usual 4x8' bed. If I was to create a 8x12' bed I could make it work as a 3 sister garden. My question is if I did that could I plant it as a 3 sister bed every year and not rotate the crops?" "Lois this works best when not rotated. As the beans will provide for next year's corn crop extra nitrogen in the soil where the roots of the prior bean crop have broken down and begin the decomposition fixing the nitrogen into the soil which will help the corn which is a heavy feeder. If you search online for how the three sisters benefit the soil you will find better explanations than this. With this method I have grown the same crop combination in the same space with only allowing for the lan to rest after the seventh year. "